Combine everything except extract and salt. Bring to a boil and cook until hard ball stage or 250 F on a candy thermometer. The length of time depends on the pot size and level of heat. The first time I made it, it took almost three hours and the second time two hours. I was worried that after all the time it took to form into a hard ball stage that it would not turn out. I stirred the pot every 3 to 4 minutes for hours. One of the tests to determine if it is at the hard ball stage is to drop a bit of caramel into cold water. If the tail of the caramel tear drop stays upright in the water, it is ready. When it finally reaches the hard ball stage, remove from heat and stir in the extract. Then pour into a greased 9 inch by 9 inch pan lined with wax paper that overlaps the sides. Sprinkle coarse salt on top. Cool completely. Using the edges of the wax paper, flip out of the pan onto a cutting board. Cut into small cubes with a large long sharp knife. Store between layers of wax paper in a dry place for up to a week. Can be frozen. This is a delicious. The density is perfect – firm and chewy. It reminded me of the Mackintosh candy bars I used to buy as a special treat as a child. The current caramel bars are thin and brittle. The contrast of sweet and salt is just right and reflects a new post modern food trend. This recipe is definitely a keeper and will become a Christmas tradition. Gluten free. It is also perfect for giving away as small gifts given the caramels are so decadent. Mix and bring to a boil for 10 minutes. Test the thickness of the jam by dripping some from a spoon. When thick drops fall off the spoon, it is ready. Fill small sterilized one half cup canning jars and then process for 10 minutes in a canner. Cool. Apply labels. 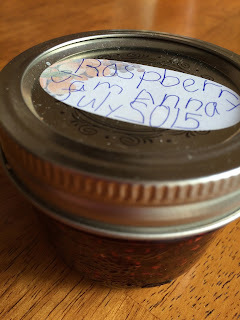 Ensure the six year old labels the jam with her neat and interesting six year old printing style. I read this recipe, promptly forgot the ingredients and started to improvise. Recently I found the recipe and was startled how much I had drifted away from the original into my own creation. Unfortunately every time I make the dish, it is always delicious, never to replicated because it is different each time. So here are the basics. Place slices or leave as a round of 8 oz. creamy goat cheese on a nice platter. You might want to surround the cheese with slices of English cucumber. There is something pleasing on the palette when you have the softness of the cheese against the crunch of the cucumber. I like the colour as well - green and white speckled with brown bits. Then add 3 to 4 bay leaves. Simmer on low heat for 15 minutes. Add 2 cloves of garlic, thinly sliced. Brown. Watch at this point because the garlic browns quickly. 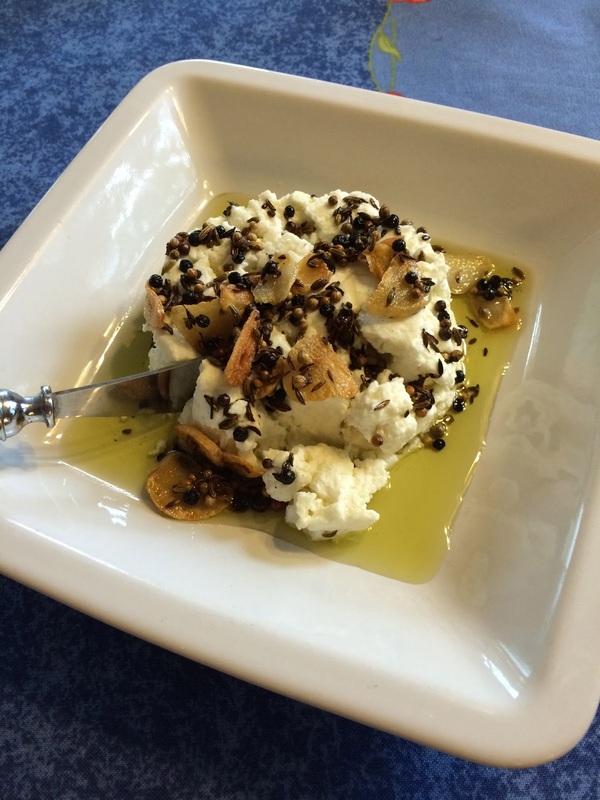 When the garlic is a golden brown, pour the oil over the goat cheese slices. Surround the cheese with slices of cucumber. Serve with crusty long thin baguettes cut into rounds. The combination of cheese and cucumber on crusty bread is so good that the last time I served it; we decided that this should just be the main course. We literally licked the plate clean. The conversation was equally as good. The original recipe has one bay leaf (a small one), ¼ tsp of seeds (fennel, peppercorns and coriander) and 1 tablespoon fresh rosemary leaves. I can see why I was attracted to this recipe. The next time I make it, I will include fresh rosemary to see how the flavours change. One of the easiest, creative and simplest appetizer is popcorn. However you can really change the perceptions of plain popcorn by this recipe. Bring to a boil. Whisk. Cool for 5 minutes. Pour over 4, 6 or 8 cups popped corn. Toss well. Sprinkle with Himalayan salt. The fewer cups of popped corn used, the greater intensity of flavor. I used 8 cups of popcorn. The flavor was subtle, slightly sweet but not cloying because the bacon fat cut the sweet of the syrup. The bacon flavor in turn was muted. Overall the flavor was nicely balanced and very different from the usual buttered and salted popcorn. Great for entertaining. Brunch can be a very creative meal and not just dominated with the usual menu of pancakes or waffles. This recipe was in the September 2015 Canadian Living magazine. It is one of those dishes that just catches your eyes as you flip through a magazine. 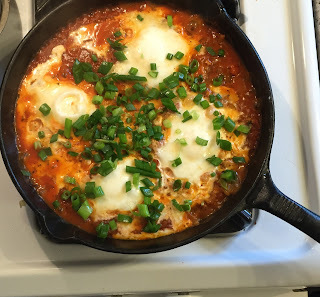 I have made it with more than 4 eggs, sprinkled it with cheese and will explore trying to make it with a base of celery root rather than fennel. I do like the fennel because it adds another interesting flavour. In a large skillet heat oil over medium heat, add fennel and water. Cook till soft and water has evaporated. Note - you could just use water and skip the oil. Add white parts of the onion and cook till fragrant, about one minute. Stir tomatoe sauce, vinegar and sugar together and pour over the fennel. Make four indents and place an egg in each indent. Partially cover and simmer until the eggs are cooked. Sprinkle with green onion tops. Grind pepper and salt on top. Place the entire pan on the table so the guests can see the contrasts of red, white and green. Serve with toast. It was one of those restaurants in the center of the city that was more bar than meals. So we each had a glass of wine and appetizers. One of the most unusual appetizers were the pickled chili carrots. It was a wonderful combination - tart pickle with the right bit of kick. The red wine and pickles were holding hands in our mouths. The only draw back to most pickles is the high salt content. I recall reading about a person with heart disease who was admitted to Emergency because he had eaten a dill pickle. There is a great deal of salt in just one pickle. I wanted low salt pickles and did even better. I found a recipe with no salt and modified it - the final product was delicious and a rival to the pickled carrots we had in the restaurant. Peel one pound of carrots. Cut into three inch sticks to fit into a small glass jar. The sticks should be uniform and about one third of an inch wide. Boil the sticks for 10 minutes. Drain.The carrots should be firm but not mushy. Make the brine by bringing to a boil: 3/4 cup vinegar, 3/4 cup water, 1/2 cup sugar and 1 teaspoon dried red chili flakes. Pack the carrots into hot sterilized jars. Pour the brine on top. Seal. Process for 15 minutes. Cool. Tighten the lids once more. Label. Share. These are ideal Christmas presents.